Article on "The Christain Index" web site. The Christian Index recently published a full length article about Sportmen's Outreach. You can read about his life story and personal testimony. Sportsmen's Outreach is designed to reach people with the gospel of Jesus Christ. We use unique and creative ways to share the gospel. What does Sportsmen's Outreach do? Speak at worship services, Sunday school rallies, mission groups and conferences, RA & GA programs, camps and retreats, revivals and creative outreach events. Provide motivational speakers who promote positive values to students. 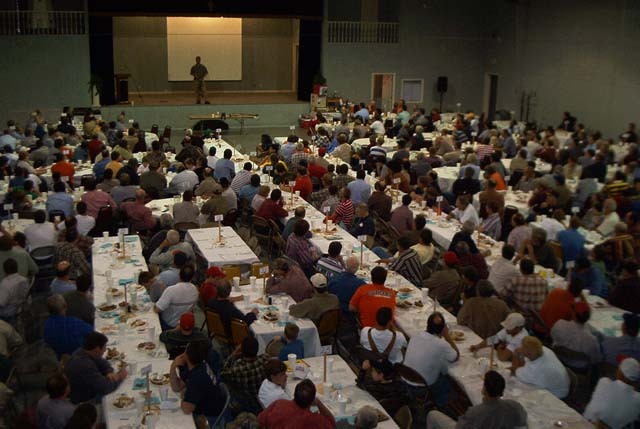 Coordinate Wildgame Banquets, fishing seminars and tournaments, retreats and father/son events. 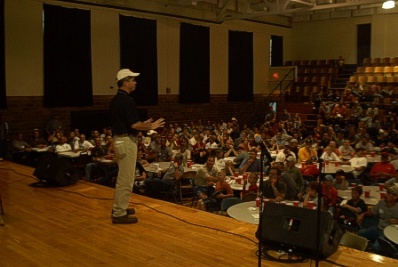 Glenn Chappelear speaking at a men's conference. Glenn Chappelear is the founder of this ministry. He is a professional bass fisherman on the and the Forest L. Wood tour. He is a Mission Service Corps Volunteer for the North American Mission Board. He is a graduate of Clemson University and Southwestern Baptist Theological Seminary. He recent served as Minister to Students for 10 years. In 2004 Glenn was featured on the Buckmaster's website June article, Muzzy's Extreme Outdoors, 3 videos and several OEI television shows. He is married to Donna Heath and they have 3 children, Hannah 10, Rachel 9, and Caleb 7. To schedule Glenn for a speaking engagement contact The Mitchell Group booking agency using the contact information below. Most of what Glenn does is done on an honorarium basis, plus expenses for lodging and travel. However this is negotiable.